This article explains how to configure the expires header for a Rails application running behind Nginx. Nginx is popular amongst Rails developers for fronting a cluster of mongrel web servers. I'll not say much more about it, on the assumption that this article probably won't be of much interest to you if you're not already using it. So how do we speed your Rails site up? More information on the Expires header (and other great performance enhancing tips) can be found amongst Yahoo's Best Practices for Speeding Up Your Web Site. If we were to edit the file and redeploy the application the timestamp would be updated, and the browser would realise that it needed to download a new copy of the file. The Rails documentation for AssetTagHelper covers how to configure a far future expires header under Apache (search for "FilesMatch" to find it). Note that we're matching suitable file types, but only setting the expires header for files that have a timestamp appended. It's all well and good sticking the config in nginx and restarting it, but it's nice to know that the stuff works, right? If you're not already using it, get a copy of Firefox and install Firebug. 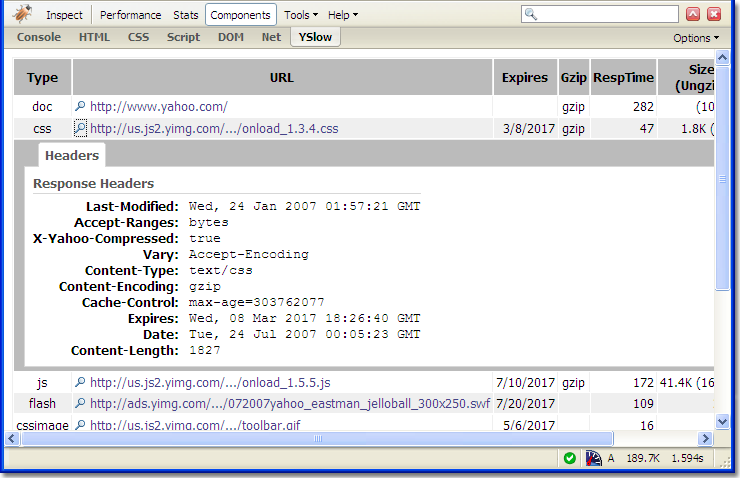 Then install Yahoo's YSlow plugin for Firebug.